Governor Terry Branstad has issued a written statement, formally accepting President-elect Donald Trump’s invitation to serve as the U.S. Ambasssador to China. 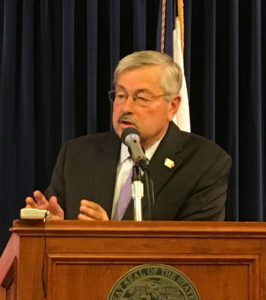 Branstad called it his “new mission” and he described that mission as maintaining “a collaborative and cooperative relationship” between the U.S. and China. Branstad began by saying he’s been privileged to serve as Iowa’s governor for 22 years, but he plans to seize this “extraordinary opportunity.” Read Branstad’s full statement below. When Branstad resigns as governor, Lieutenant Governor Kim Reynolds will take his place. Reynolds issued a written statement this afternoon describing Branstad as her mentor and friend — and indicating “information about a transition will be forthcoming.” Her full statement is posted below. Iowa Ag Secretary Bill Northey had been considering a run for governor in 2018, but Northey issued a statement today saying he will not run against Reynolds and Northey asked Iowa Republicans to unite behind her once she takes over as governor. His written comments are at the bottom of this post. I love Iowa and I love my country. For 22 years, I have been honored and privileged to serve the people of Iowa as their governor. My family and I will always be grateful to Iowans for trusting me to lead and putting their faith in me to serve. America is at a crossroads, and the American people are looking for bold change to renew our position as the leader in the world. To once again hold America up as that ‘shining city upon a hill’ as President Reagan so proudly proclaimed. By electing President-elect Trump on November 8, this message was sent loud and clear by the voters. During our 30-year friendship, President Xi Jinping and I have developed a respect and admiration for each other, our people and our cultures. The United States – Chinese bilateral relationship is at a critical point. Ensuring the countries with the two largest economies and two largest militaries in the world maintain a collaborative and cooperative relationship is needed more now than ever. The President-elect understands my unique relationship to China and has asked me to serve in a way I had not previously considered. After long discussions with my family, I am honored and humbled to be nominated to serve as the U.S. Ambassador to China. I also accept President-elect Trump’s charge to prioritize collaborative policies that will Make America Great Again. This is an extraordinary opportunity. I believe that the respect and admiration built over a decades-old friendship between President Xi and I give me an opportunity to help the President-elect and serve Iowa, the United States and the world for the better. This new mission to continue serving my state, and my country, in a new role is essential to building a bright future for our children and grandchildren. With my wife Chris by my side, I look forward to the work ahead but we will never have Iowa far from our hearts. President-elect Trump’s decision to nominate Gov. Branstad as Ambassador to China speaks volumes about the character, talent and experience of Gov. Terry Branstad. As America’s longest-serving governor, I can think of no one more qualified and ready to represent Iowa and the United States of America on the world stage than Gov. Branstad. His hands-on experience in advancing trade opportunities for Iowa farmers and Iowa companies coupled with his strong and lasting relationship with President Xi Jinping, as well as other leaders in China will serve him well in strengthening U.S.-China relations. Gov. Branstad has been my mentor and friend, devoting his life to advocating for Iowa. His record-setting public service as governor speaks for itself and has, without a doubt, made this state better. Gov. Branstad has never backed down from a challenge. I’m excited and proud to see him accept the responsibility as top envoy between the U.S. and China, and know that Iowans will be proud of his service on the world stage. I have been honored to be a full partner with Gov. Branstad in this Administration and know that the experience I’ve gained over the last six years has prepared me well for this next chapter of service to all Iowans. My family and I wish to extend Gov. Branstad, Chris and their family our most sincere congratulations as they accept this role together, knowing full well they will never be far from Iowa. Information on a transition will be forthcoming. “Governor Branstad is uniquely qualified to serve in this critically important position. Iowa and the entire nation will benefit from his leadership of our diplomatic efforts in China. For the Governor, public service has always been about responding to the call and putting his state and nation before his own interests and this is just another example. “As Iowans, we will miss his steady leadership and passionate service here at home, but his leadership in China will be felt here in Iowa. His influence in this new position will not only be good for agriculture and trade, but good for America. “The Governor leaves the state in a tremendous position thanks to his leadership over the past 6 years. With Lt. Governor Reynolds as our next Governor, Iowans can be assured that we will continue to advance the Branstad/Reynolds agenda of addressing water quality, improving education, reducing the size and scope of government, increasing family incomes and creating new jobs.